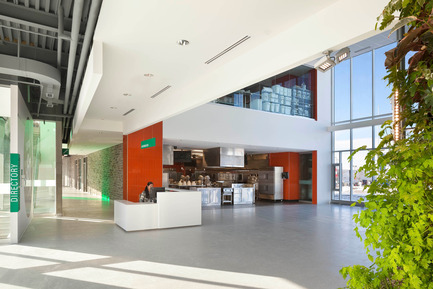 Toronto, Canada, 2015-10-16 - The Centre for Food (CFF) at Durham College (DC) distinguishes itself in the highly competitive field of culinary education by bringing together culinary, hospitality, event management, food science, and agricultural and horticultural programs in a state-of-the-art facility for “field-to-fork” culinary education. 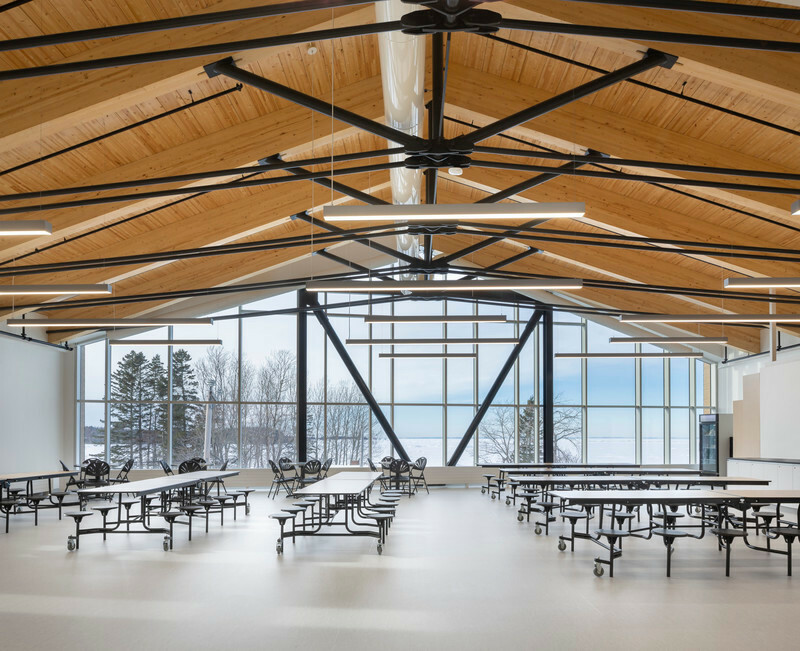 The new 34,000-square-foot facility anchors DC’s developing Whitby campus. 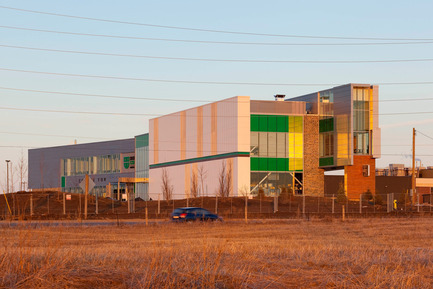 As the Greater Toronto Area expanded east, this former heritage agricultural area located an hour east of Toronto along the busy Highway 401 has rapidly industrialized. 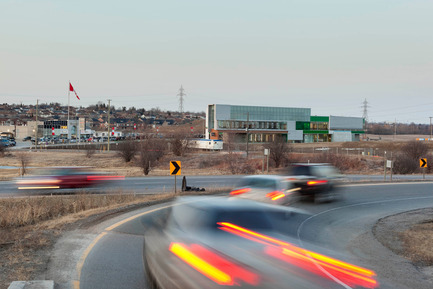 Strip malls and fast food outlets have dominated the surroundings for many years. 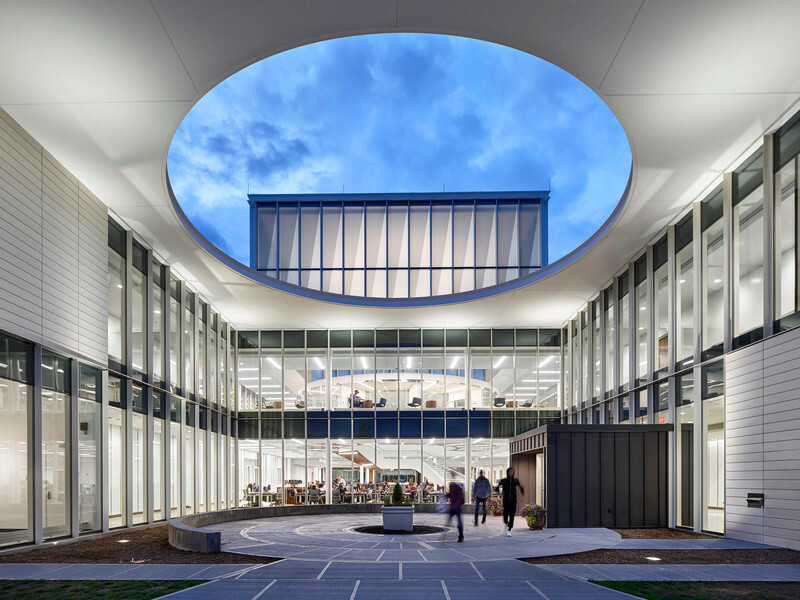 The Centre for Food leads a resurgence to its agro roots with an agrarian campus that preserves the rural quality of the transforming landscape. Acknowledging the need to harmonize the natural and built environment, the CFF provides students with a hands-on experience completing the full cycle of production from farming to preparing, serving and celebrating food. 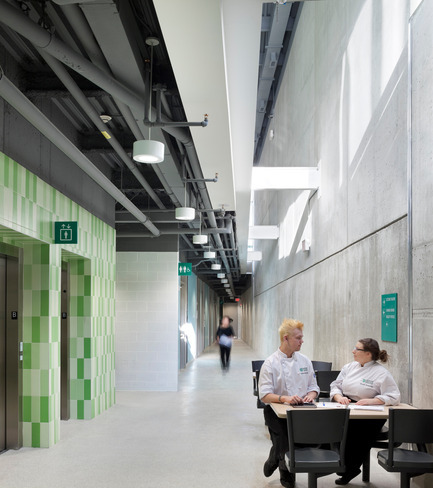 Students and visitors enter the building from the parking lot, passing the centrally located food storage and distribution room, a space traditionally confined to back of house. 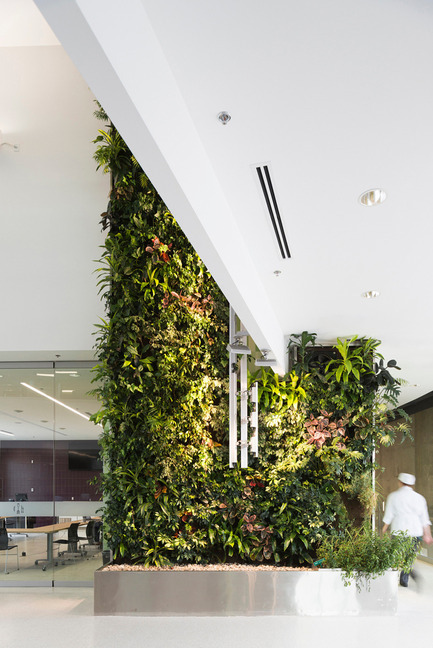 A hallway with a mock hotel suite leads to an atrium with a two-storey living wall for the cultivation of herbs. 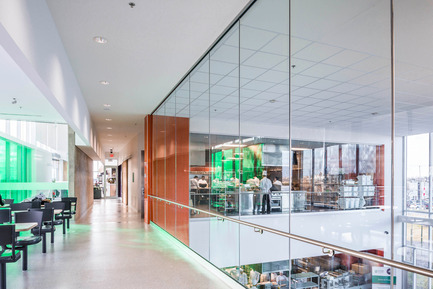 Steel and glass foldable partitions allow the adjacent wine tasting lab and bake lab to open up onto the atrium expanding the venue for events and celebrations. 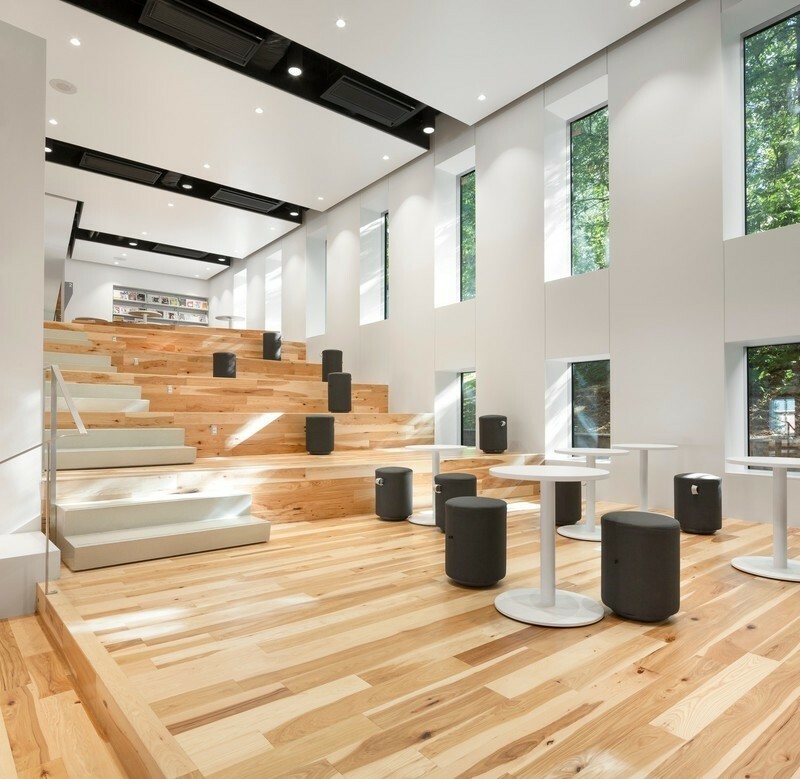 Downstairs, a 150-seat lecture and demonstration theatre, change rooms and faculty offices branch off a naturally lit hallway with tables for students to relax. 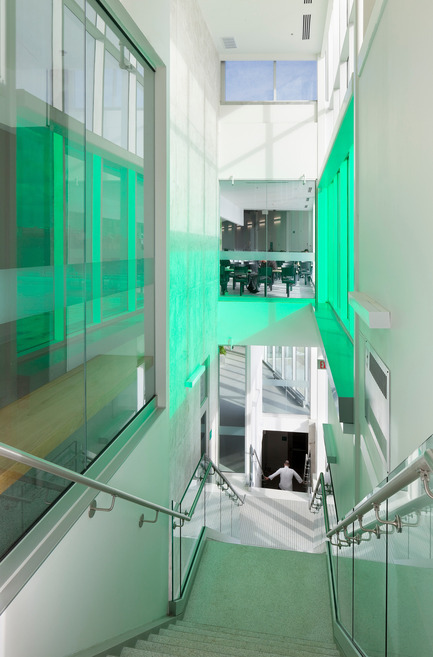 Upstairs, interior windows provide glimpses into the teaching labs, encouraging exploration and establishing a dynamic energy within the building. 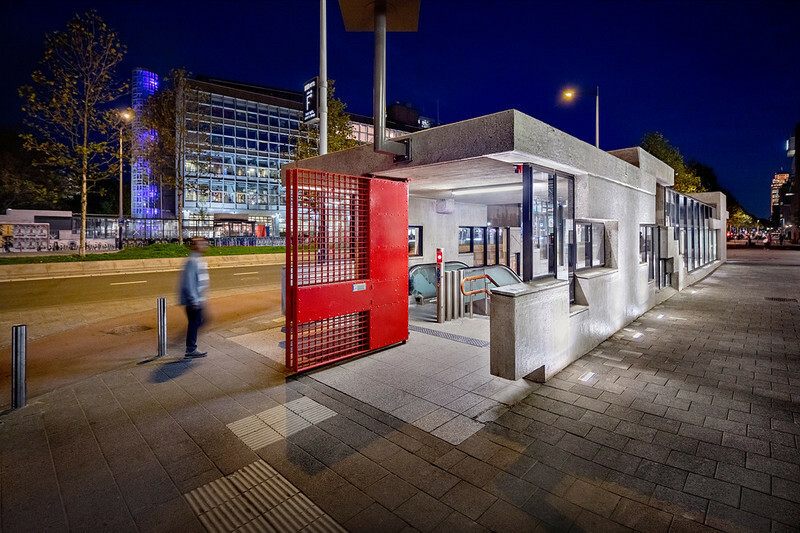 Marble, Corian, stainless steel and ceramic tile reduce visual clutter, maintain sanitation and enhance function. 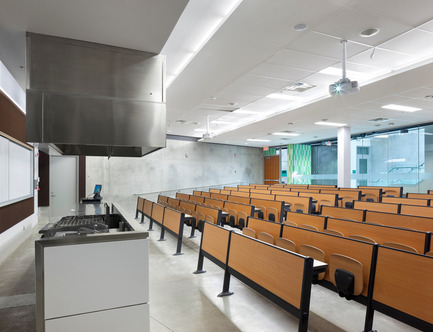 In the culinary labs, the workstations are on casters, a first-of-its-kind approach to increase flexibility, allowing instructors to easily rearrange the rooms. 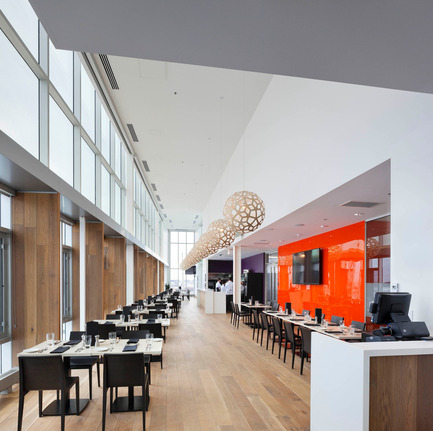 In contrast to the clinical nature of most culinary institutions, warm woods, soft stones and natural colours create an inviting and open atmosphere. 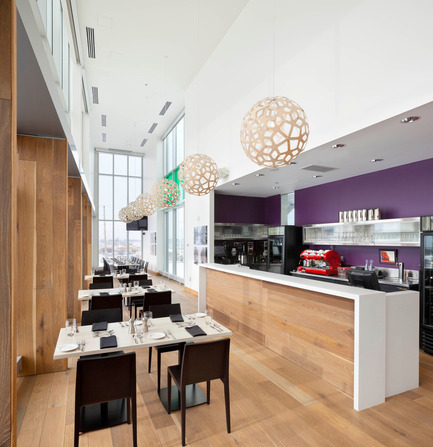 The sequence of spaces culminates on the second floor with Bistro ’67, a soaring 70-seat, full-service, green-certified, teaching-inspired restaurant open to the public and featuring expansive views of the campus. 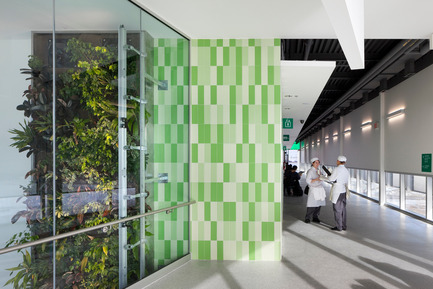 Highly visible to passing commuters, Bistro ‘67 attracts the public to visit and learn more about the Centre for Food. Students learn to prepare fresh, seasonal dishes from a menu that celebrates Durham’s local produce and fresh flavours. Real-time video monitors enable diners to see their food being prepared while staff and students can observe how it is received, gaining practical hospitality experience. LEDs sparkle within oversized bamboo pendant lights. 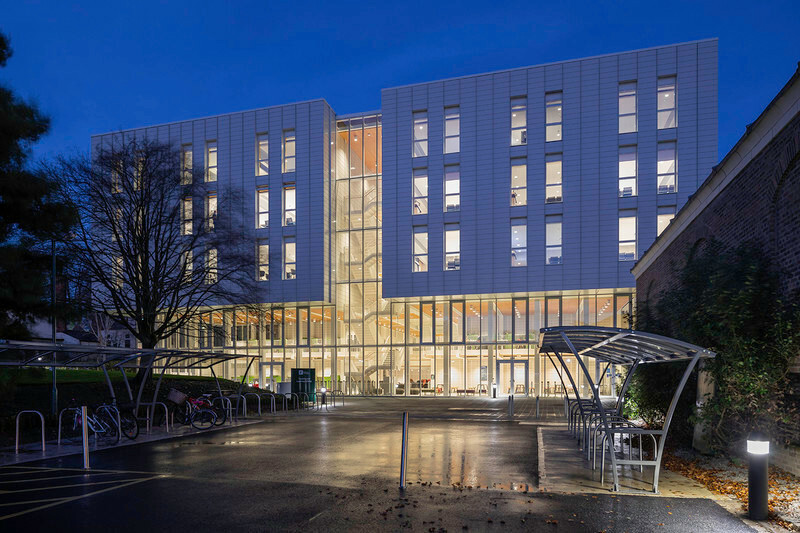 The design both aesthetically and environmentally considers its context, visually connecting the contemporary building with its rural landscape. 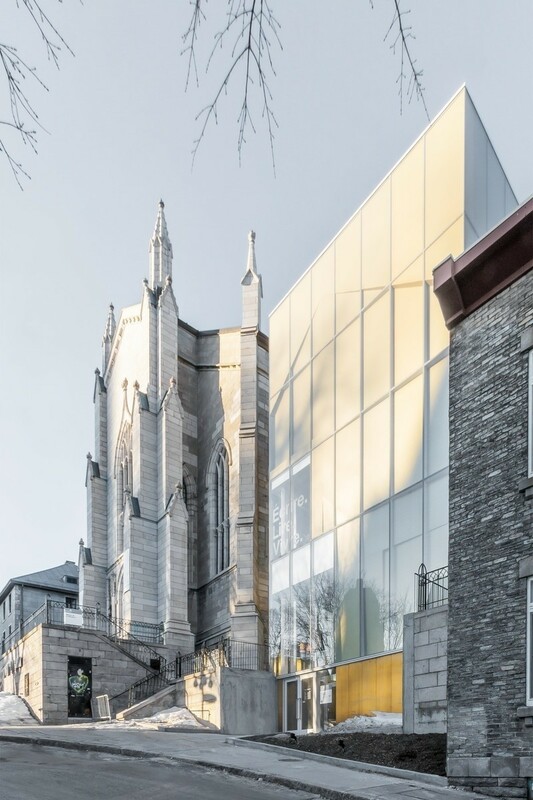 The building’s broad views and materials announce its regionalism and connections to nature. 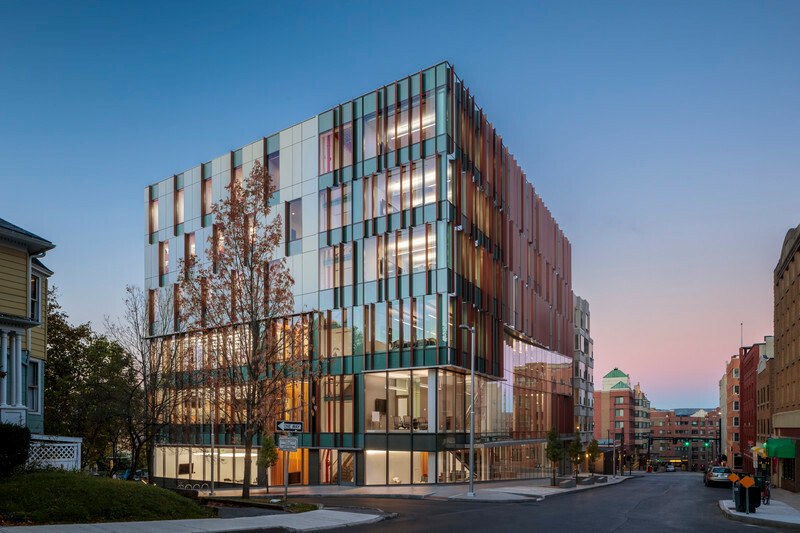 Fritted low E and coloured glazing minimize heat penetration on the south elevation controlling the temperature and maximizing energy efficiency of the mechanical system. Preliminary steps have been taken towards the second phase that will see the school continue to cultivate the surrounding landscape to support field-to-fork learning and research. Students in the horticulture program have already planted fruit orchards, farm fields and greenhouses that grow produce used in the kitchens, laboratories and Bistro ’67. 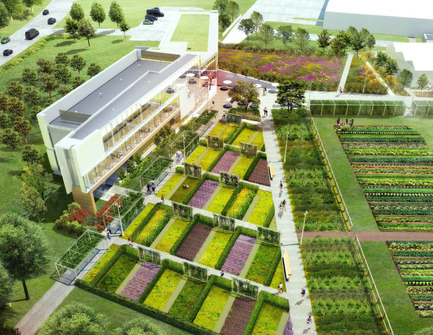 When completed, energy will be drawn from photovoltaic panels and the building will be insulated by a green roof and topped by an apiary for honey production. The interconnected programming at the CFF encourages students in all the departments to foster a strong understanding of the relationship between food and the environment and helps to maintain Ontario’s strong agricultural tradition. Plan for the surrounding gardens and cultivated agricultural landscape.